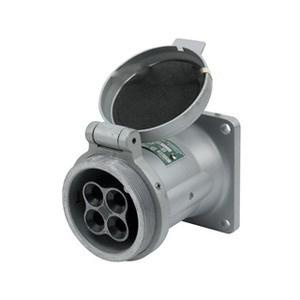 Appleton Powertite® Polarized 4-Pole 3-Wire pin and sleeve receptacle has current rating of 100-Amps and voltage rating of 600-Volt AC/250-Volt DC at 3-Phase. It operates in frequency range of 50 - 400-Hz. This weather-proof receptacle has copper-free aluminum construction and supports NEMA 4X enclosure. It accommodates size 4 - 1 building wire and size 4 - 2 extra-flex wire. It accepts 0.875 - 1.906-Inch OD cable. It withstands temperature rating of -40 to 107 deg C. Receptacle meets NEC/CEC standards.